You have the perfect bike, you’re training hard, you’re wearing your shoes for cycling and running, but there is something missing. Pedals can make a difference in your performance when you’re mountain biking or cycling on the track. Triathlons are about seconds (if you’re lucky), and they’re vigorous. You’ll test every fiber in your body, but you don’t need to work harder. You have to work smarter. Proper pedals allow for proper, refined release and a lighter weight that gives you the competitive edge. The best part is that pedals can be swapped out in minutes. Material: The pedal’s material is often overlooked, but it’s vital when going into a triathlon. Carbon fiber, for example, is durable, but one of the lightest materials on the market, which makes it the perfect choice for longer competitions and races. Tension Control: Anyone just starting out will find that a low tension allows for an easier release, which is the optimal option. Advanced riders can adjust this tension control to allow for a comfortable, refined ride that matches the rider’s preference. Float: Clipless pedals use a float option. The float allows the foot to move a certain degree before release from the pedal. A float allows your feet to pivot slight when pedaling so that you can find the ideal setting for your riding style. We’ve reviewed a few of the top tri pedals on the market, and they’re listed below to help you make the right choice for your new pedals. If you’re still having trouble picking one pedal over another, feel free to read our guide at the bottom of the post. Shimano Ultegra PD-6800 SPD-SL Pedals – Shimano’s PD-6800 pedals are offered in two sizes, and this pair of pedals is a nice addition to any cycling or BMX bike. What makes these pedals stand out from the competition is the carbon fiber and aluminum design that allows for a lightweight, durable pedal. The cleat plate is made from aluminum. Entry and release is adjustable, and a float of +/- 3 degrees is offered. Users will be able to install these pedals with an 8mm Allen wrench. The wide bearing placement allows for proper distribution if the rider’s weight. The retention and release of these pedals is unmatched. Weight with cleats is a mere 353g. 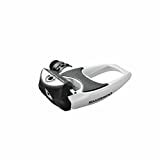 Shimano SPD-SL Light Action Road Bicycle Pedals – The SPD-SL light action pedals offer a sealed cartridge axle, and a white or black color option. These are a great upgrade from stock pedals, yet these pedals won’t break the bank. A lighter spring tension allows users to pedal faster with less exertion required. Cleat retention adjustment is provided, and there is a resin body. In terms of weight, these pedals weigh a mere 330g. Clipless road pedals are easy to clip into place and offer maximum power transfer to get the competitive edge on the track. This is a one-size pedal, so it will fit nearly every bike on the market. Shimano Dura-Ace PD-9000 SPD-SL Pedals – Shimano’s Dura-Ace PD-9000 is black and grey. These lightweight pedals are manufactured with a carbon composite to allow them to be lightweight and durable. A stainless steel top plate adds to the appeal of these pedals, and users will benefit from an extra wide platform. Smooth, three bearing axles are present, and a wide bearing placement enhances load distribution. Adjustable entry and release tension settings allow for maximum customization of these pedals. The weight for the pair is just 248g, and the use of injection molded carbon allows for a long-lasting design. This is a single sided pedal system, and a 4mm longer axle is available. Shimano PD-A600 SPD Road Bike Pedals – The Shimano PD-A600 is an ideal road bike pedal, and it’s made with SPD bindings for added performance. Again, Shimano adds in the extra-wide platform that allows for maximum, efficient power transfer so that you can accelerate easier. Low-maintenance, sealed cartridge axles are used. Cleat tension indicators provide users with the option to adjust the tension on the cleat. These one-sided pedals are a traditional touring pedal, but you can use them as a road pedal, too, so they’re versatile. The cleats can be recessed in the sole to allow riders to walk around in their shoes. These road bike pedals are great for everyday use. Shimano Unisex PD-M520 MTB SPD Pedal – A one-size option by Shimano, the PD-M520 pedal is an open design pedal that’s great for an entry-level pedal upgrade. The open binding style allows the pedals to better protect against mud, and the low-maintenance bearings use a sealed cartridge design. Cleat tension adjustment is available so that riders can adjust the tension to their own riding style. The cleats for your shoe are included, and these are pedals that can be used on any bike. Hybrid and mountain bike riders as well as cycling bikes have these pedals installed for added performance. Weight for the pair is just 380g. These are ideal for MTB and road cyclists. Pedals seem irrelevant to novice riders, but for a person with experience, it’s easy to see how even a slight change in the weight or style of a pedal can make a big difference in performance. If you’ve read through the reviews above, you’ll see that there are a lot of similar pedals to pick among. One small difference can make a pedal better or higher priced. Weight is a major consideration, as are the features we listed in the first part of this article. When installing the pedals for the first time, you’ll want to make the proper adjustments and test the pedals out for yourself. The pedals may take some getting used to, and you don’t want this adjustment period to happen when you’re in the midst of your first triathlon. Weight: If a pedal is too heavy, it will slow the rider down and hinder performance. 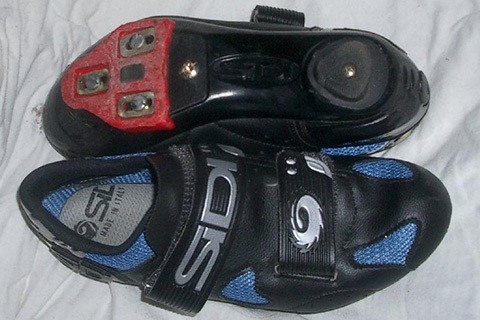 You’ll need to consider the pedal’s weight with and without the cleat to judge its true weight. If you need more speed, a lighter pedal is a good starting point. Reviews: I’m a stickler for reviews, but when you’re buying tri pedals, it’s important that you find models that can will boost your performance. Reviews will tell you the truth of what the pedals offer and how they can help improve your performance during a triathlon. Budget: Pedals are available in a wide range of prices, so if this is your first triathlon, make a budget and find a pedal you can afford. Numerous pedal options are available, and so you are sure to find one in your budget.